It is really amazing and ridiculous that, not only the so called pseudo secular and the Marxist historians of India , but also the Western historians portray the Mughal emperor Akbar as a great monarch. But are there sufficient grounds to project him as a great man? The Indian historians, according to the guideline set by the ongoing politics of Muslim appeasement, have to glorify each and every Muslim ruler including Akbar as a compulsion. But it is really incomprehensible why the historians of the West are also in the race in glorifying Akbar, who, in reality, was a foreign invader and came to India to plunder this country. Above all, Akbar was a Muslim and, like each and every Muslim, he possessed three basic Islamic qualities – treachery, lechery and butchery. In several occasions, Akbar played vile treachery with the Hindu kings. Akbar was a cruel killer, who butchered innocent Hindus in millions. As a lecher, Akbar maintained a harem of 5000 women, most of whom were abducted Hindu housewives. So it is necessary to make a fresh estimate of Akbar to asses his greatness. Akbar spent a part of his early life in the Princely State of Rewa (in present day Madhya Pradesh) where Akbar grew up in the village of Mukundpur . Akbar and prince Ram Singh who later became the Maharaja of Rewa grew up together and stayed close friends through life. Humayun was the eldest son of Babur. For some time, Akbar was raised by his uncle Askari and his wife in the eastern country of Persia and Afghanistan.He spent his youth learning to hunt, run, and fight, but he never learned to read and write. The so called pseudo-secular and Marxist historians paint Akbar as a generous, kind hearted tolerant king free from religious bigotry, and a genius with refined tastes in the arts, architecture, music and literature. But it is to be seen, how far their portrayal is true. It has been mentioned earlier that Sher Shah ascended the throne of Delhi on May 17, 1540, by defeating Humayun in a battle near Kannauj and he died in an accident in 1545 AD, in Kalinjar. After his death, anarchy appeared again. The nobles made Jalal Khan, the second son of Sher Shah, the Sultan of Delhi , depriving the eldest Adil Khan as the latter was incompetent, lazy, and ease-loving. After ascending the throne, Jalal Khan assumed the title of Islam Shah. Soon after, a group of nobles made a conspiracy to murder Islam Shah and put Adil Khan on the throne. But the plan divulged and Islam Shah put all the conspirators to the sword. On November 22, 1554, Islam Shah, after ruling for 9 years and’ 6 months, died and his nobles put his minor son Firuz on to the throne. But after a few months, Mubariz Khan, a cousin of Firuz, murdered him and ascended the throne assuming the new name of Muhammad Adil Shah. But he was unsuitable as a ruler. On the other hand, the news of Islam Shah’s death inspired Humayun to invade India and recover his lost territory. At this juncture, Bairam Khan came to Humayun’s help that enhanced his strength considerably and enabled him to re-conquer Kabul, News of these developments made Adil Shah very shaky and he gave up all the responsibilities to his most trusted employee Himu, a Hindu officer, and this incident facilitated Himu to raise himself as the most important man in North Indian politics. This was the time when the star of Himu’s fortune shone brightest- Adil Shah appointed him the Wzir (Prime Minister) and the incident initiated his rapid rise. But most of the Muslim historians did not like an infidel to hold the highest post in the court of a Muslim king and hence they tried to blacken his character it every opportunity. Who this Himu was ? Historian R. C, Majumdar, in this regard, writes, “Himu was born in a poor family of Dhansar section of the Baniya caste, living in a town in the southern part of Alwar”. Muslim historian Badayuni has described him as a resident of a small town called Rewari in the taluk of Mewat, and according to him, Himu began his life as a green vendor. Others believe that Himu was a hawker in the town of Mewat. However, at a certain stage, he succeeded to draw the attention of Adil Shah, who appointed him the Superintendent of the Delhi market. But by dint of his sincerity and sense of responsibility, he became a favourite of Adil, who started to elevate him to more and more responsible posts. When Adil Shah died, Himu was the Chief of the Intelligence Department and, at the same time, the Head of the Postal Department (Daroga-i-Dak Chowki). At that time, Junaid Khan, the governor of Bayana, and his son, the phaujdar of Ajmir rebelled. Adil Shah sent Jamal Khan against him with a large force. But in a severe battle at Kanulapur, Junaid became victorious. The incident made Adil Shah very depressed. Then Himu said, “O Lord of the World, if you will trust me with a small force, I will either overcome Junaid Khan, or perish in the attempt”. The King yielded to his solicitations and sent Himu with 3000 or 4000 horsemen and four war-elephants. Junaid deputed his assistant Daulat Khan to defend Himu. A battle was fought and Daulat Khan was defeated and slain. Then Junaid himself advanced with 8000 strong cavalry to confront Himu, while Himu had only 3000 horses. So he decided to attack the enemy in the darkness of night and Ahremad Yadgar, in his Tarikh-i-Salatin-i-Afghana, writes, “The enemy remained on the alert during the three watches of the night; but in the last watch they grew negligent and fell asleep, The soldiers of Adil Shah fell furiously on them on all sides. Himu did not give the time to put enemy their armour and the Afghans, sword in hand, passed through their enemy slaughtering all they met.” Himu then went to the court of Adil Shah and Yadgar writes, “He (Himu) then stood with folded hands in front of the throne. Adil Shah honoured him with a purple khilat (garment), the coller and the skirt of which were covered with jewels”. At that time, Ibrahim Khan, a cousin of Adil.Shah and the governor of Agra , rebelled. Adil Shah sent a detachment against him, but Ibrahim routed them. Then Ibrahim marched towards Delhi and ultimately occupied the city. Inspired by the success of Ibrahim, Ahmmad Khan Sur, the governor of Lahore and brother-in-law of Adil, assumed the name Sikandar Shah and rebelled. In the east, Muhammad Khan Sur, the governor of Bengal revolted and assumed the title of Shamsuddin Muhammad Ghazi. So the empire of Sher Shah got divided into four parts, Delhi and Agra went to Ibrahim Khan, Punjab went to Sikandar Shah, Bengal to Shamsuddin Muhammad and the remai­ning part under the control of Adil Shah. Meanwhile, in 1555, Sikandar Shah invaded Delhi , in a severe battle he defeated Ibrahim and thus Delhi went under the control of Sikandar. On the other hand, the rivalry among the Afghans provided a great opportunity for the Mughals to recover their lost empire. In November 1554, Humayun left Kabul , advanced towards Lahore , and in February 1555, gained control over the city almcst without any resistance. Then Sikandar Shah marched against Humayun with a 30,000 strong cavalry. A severe battle took place at Machhiara near Ludhiana and Sikandar Shah suffered a complete defeat. Sikandar then marched again against Humayun with 80,000 horsemen, but he was again defeated in a battle near Sirhind and fled to Sivallk Hills. In that hour of crises, Adil Shah Appointed Himu the Wazir, or the Prime Minister of his court and handed over civil, military, finance and, in fact, every other responsibility to him. It is really surprising that Adil Shah, a Muslim king, selected a Hindu kafir for the highest position of his government, and there is no doubt that had Adil could find Muslim candidate suitable for the post, he would certainly not have selected an infidel like Himu for the post. The incident shows that the competency of Himu, for the post, was beyond any dispute. After assuming the new responsibility, Himu at once marched against Ibrahim and defeated him twice, first at Kalpi and then at Khanwa. To narrate Himu’s victory, Nizamuddin Ahmroad in his Tabakat-i-Akbari, writes, “Adil now sent, the bakkal, who was the Wazir, with a large force, and with 500 war-elephants and artillery, against Agra and Delhi . When Himu reached Kalpi, he resolved to dispose of Ibrahim first and hastened to meet him. A great battle followed, in which Himu was victorious, and Ibrahim fled to his father at Bayana, Himun followed and Invested Bayana, which he besieged for three months”. Himu then marched against Muhammad Shah and a battle was fought at Chhapparghatta , a place 20 miles away from Kalpl. Muhammad Shah was defeated and Himu gained control over Bengal. 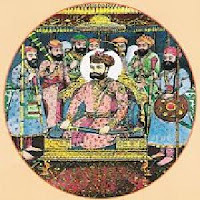 Following the chaos over the succession of Islam Shah (Sher Khan Suri’s son), as mentioned above, Humayun reconquered Delhi in 1555, with the help of an army partly provided by his Persian ally Shah Tahmasp.But a few months later, on January 26, 1556, Humayun died and Bairam Khan, the guardian of Akbar, cleverly concealed the report of Humayun’s death in order to prepare for Akbar’s accession to the throne. On February 24, 1556, Akabar, a 13 year-old boy, was proclaimed Shahanshah (Persian for “King of Kings”) of Hindustan . by Bairam Khan at Kalanaur (Gurdaspur, Punjab). At that time, Himu sought permission of Adil to attack Delhi . Ahmmad Yadgar narrates, “Himun went in front of the throne and said, “O King, the case is this; he (Akbar) is now a child of ten years old, who has lost his father, and the Mughal army is not yet firmly established. It is easy to root up a small plant”. Adil Shah derived confidence from his speech and prepared a powerful force. He sent 7000 horsemen and 20 war-elephants with Himun, who went march by march to Gwalior”. From Gwallor, Himu advanced towards Agra and Adil Shah, on the other hand, went to the safe place at the fort of Chunar. Then victorious Himu entered Delhi and Nizamuddin Ahmmad, in his Tarikh -i-Akbari , writes,”Himun had greatly vaunted his achievements at Delhi and had taken to himself the title of Raja Bikrsmjit”. To narrate the same victory, Ahmmad Yadgar, in his Tarikh-i-Salatin-i-Afghana, writes, “Himun rejoiced this victory, sent an account of his success, together with the Spoils captured from the Mughals, to Adll Shah, who was exceedingly pleased when he received it,…He (Adil Shah) gave a great festival and sent Himun a dress of honour, adorned with jewels and worked with gold threads” Ahmmad Yadgar continues to write,” … he (Himu) entered Delhi, raised the Imperial Canopy over him and ordered coins to be struck in his name. He appointed a governor (of Delhi) of his own and brought the Delhi territory and the neighbouring parganas under his control and in order to console the King, he sent an account of the victory in these words,”Your slave, by the royal fortune, has routed the Mughal army, … but I hear that Humayun’s son commands a numerous force and advancing against Delhi”. The battle began in the morning on 5th November, 1556, at Panipat and to describe the same, Nizamuddim Ahmmad writes, “Himun then advanced with his elephants, and made such a determined charge on the Imperial army that the left wing was shaken…. Himu then drew off his forces, and made an assault upon the centre, which was under the command of Khan-Zaman. He led all his elephants against the Khan’s men, who received him with shower of Arrows. An arrow pierced the eye of Hemun, and came out at the back of his head. When those who were fighting under him saw his condition, their hands were paralyzed, and they broke. The Imperial forces pursued them, and cut many of then, to pieces.”  According to Abul Fazl, Himu had divided his army into three divisions and he himself was leading the central division with 500 elephants and 20,000 Afghan and Rajput horsemen. So, many believe, when Himu was on the verge of winning the this battle, the accident occured, leading to his defeat. After the battle was ended, in accordance with the ghastly custom of the times, a tower was built with the heads of the slain. This “tower of heads” tradition and ceremony was religiously observed by the “magnanimous” Akbar, like his ancestors. Nizamuddin Ahmmad, to describe the incident, writes, “Shah Kuli Khan,… drove the elephant , along with several others which had been captured in the field, to the presence of the Emperor. Bairam Khan Khan Kanan then put Himu to death with his own hand.”  So, according to Nizamuddln Ahmmad, Bairam Khan executed himu with his own hand. And similar was the view maintained by Badayuni, Abul Fazl and Faizi. So, Badayuni writes, “Bairam Khan said, “This is your first war (ghazd), prove your sword on this infidel, for it will be a meritorious deed”, Akbar replied, “He is now no better than a dead man, how can I strike him? If he had sense and strength, I would try my sword”. Then, in the presence of them all, the Khan, the warrior of the faith, cut him down with his sword. Himun’s head was sent to Kabul, and his body to Delhi, to be exposed over the gates”. He also writes, “Akbar, a boy of fourteen cannot be justly blamed for complying with the instructions of Bairam Khan. … The official story, that a magnanimous sentiment of unwillingness to strike a helpless priso­ner already half dead compelled him (Akbar) to refuse to obey his guardian’s instructions, seems to be the late invention of courtly flatterers, and is opposed to the clear statement of Ahmed Yadgar and the Dutch writer, van der Broecke, as well as to the probabilities of the case”. That was the pathetic end of the saga of a great son of Mother India, who tried his best to restore independence of this ancient country, our beloved motherland, by defeating the Muslim invaders and occupiers, but did not succeed only due to a mere accident. Furthermore, it is a matter of great regret that the people of this country have forgotten that great Hindu hero and the fascinating story of his life, achievements and sacrifice. But the tale of Himu did not end with his death. Intelligence came to Akbar that Himu’s father, his widow and other members of his family were living in Alwar, with their properties and wealth, and, on the pretext of a possible revolt by Haji Khan, the governor of Alwar, he sent a detachment to Alwar, under the command of Nasir-ul-mulk, a.k.a, Pir Muhammad. The Mughal has brought the Mewat region under the rule of Delhi and Pir Muhammad executed Himu’s father. To narrate the incident, Abul Fazl, in his Akbamama, writes, “Himu’s father was taken alive, and brought before Nasir-ul-mulk, who tried to convert him to the faith (of Islam); but the old man said, “For eighty years, I have worshipped God in way of my own religion; how can I forsake my faith? Shall I, through fear of death, embrace your religion without understanding it?” Maulana Pir Muhammad treated his question as unheard, but gave an answer with the tongue of the sword”. Immense treasures were taken with the family of Hemu whose aged father was executed.” This “tower of heads” tradition and ceremony was religuously preserved by the “magnanimous” Akbar. Almost all the Muslim chroniclers have tried to paint Himu a traitor and disloyal, because he ascended the throne of Delhi , in stead of offer­ing the same to his master Adil Shah. But, in this context, R. C. Majumdar writes “No one today can reasonably claim to know the thoughts in Himu’s mind. But a little reflection will show that there was nothing unreasonable or immoral in the aspiration of Himu. No doubt, personal ambition played a great part, but it may not be altogether wrong to think that he was also inspired by the idea of founding a Hindu Raj. This is supported by his assumption to the title of Vikramaditya”. And, perhaps, most shameful as well as most deplorable is the role of the so called secular and the Marxist historians, the most despicable group of people of independent India who, like the Muslim historians, are continuing their efforts to blacken Himu’s character by portraying him a betrayer to his Muslim Master. So, the historian R. C. Majumdar, in this context, writes, “Unfortunately, Himu’s history has been written almost wholly by his enemies who dreaded him most, and, far from doing justice to his greatness, they have tarnished his name with unmerited odium. It is time to resuscitate the memory and give a true account of the life of Hemchandra, a really great hero, whose dreams and achievements have been forgotten by his countrymen”. So, it is really unfortunate that our so called secular historians, following their sinister political guideline of Muslim appeasement, are glorifying the foreign Muslim invaders, including Akbar, by concealing their demonic activities, while projecting a real patriotic fighter, like Himu, as a villain. These people, guided by the said policy of Muslim appeasement and motivated by allurement, are going on writing distorted history of this country and thus depriving the people and their posterity from getting acquainted with their real history. The Muslim rulers who massacred hundreds of thousands of innocent Hindus within a single day in umpteen occasions, these historians are projecting those killers as honest and benevolent rulers. Those blood-thirsty Muslim rulers who, by coercion and torture, converted hundreds of millions of Hindus to Islam at the point of sword, these despicable sub-humans called secular historians are portraying those Muslim despots as noble hearted magnanimous kings. The foreign Muslim invaders who demolished hundreds of thousands of Hindu temples or converted them into mosques, these historians are describing them as generous people liberal in the matter of religion. The abominable and lecherous Muslim invaders, who carried hundreds of thousands of Hindu women and children as captives to the Middle East to be sold as slaves, these wicked historians are painting them as kind and soft-hearted rulers. Those foreign Muslim invaders, who forcibly occupied the forts and palaces of Hindu kings and did not lay a single brick, these historians are highlighting them as great admirers of architecture or great architects, and we fools are cramming those narrations years after years, without assessing the realities of those narrations. But we, the citizens of free India , have every right to know their true history. They have every right to know, who this Himu was and what were his achievements. We have the right to know the spectacular life of this great son of India , a great patriot who sacrificed his life to defend the foreign occupier Akbar. And, had not by an accident, an arrow pierced Himu’s eye and rendered him unconscious on November 5, 1556, the day on which the Second Battle of Panipat was fought, the people of India would have a different history to read- the chapter of Mughal Dynasty would have been replaced by the Hindu Dynasty of Vikramaditya Heraraj. And at same the time, the hour has arrived to decide who was really Great, Akbar or the Emperor Vikramaditya Hemraj, who now being slighted as Himu. H. M. Ellict and J. Dowson, ibid, V, 48. H. M, Elliot and J. Dowson, ibid, V, 50. H. M. Hllict and J. Dowson , ibid, V, 51. H. M., Elliot and J- Dcwson, ibid, V, 490. H. M. Elliot and J, Dowson, ibid, V, 59. H. M, Elliot and J. Dowson , ibid, V, 252. H. M. Elliot and J. Dowson, ibid, V, 252. H. M. Elliot and J. Dowson , ibid, V, 252. H. M. Elliot and J. Dowson, ibid, V, 252-53. H. M, Elliot and J. Dcwson, ibid, V, 63. H. M, Elliot and J, Dowscn, ibid, V, 64. H. M. Elliot and J. Dowson, ibid, V, 65. V. A. Smith, Akbar the Great Mogul, Oxford Clarendon Press, 38. H. M. Elliot and J. Dowson, ibid, V, 66. H. m. Elliot and J. Dowson, ibid, V, 253. V. A. Smith, ibid, 39. H. M. Elliot and J. Dowson, ibid, VI, 21. R.C. Majumdar, ibid, Bharatiya Vidya Bnavan , VII ,100. R. C. Majumdar, ibid, Bharatiya Vidya Bhavan, VII, 101.